A successful technique when veneering zirconia frameworks calls for the development of efficient veneering porcelains, which must fulfil numerous requirements. This article focuses on the mechanical requirements and characteristics of Zenoflex dimension as a modern, third-generation ZrO2 veneering porcelain and documents its performance with the aid of two aging simulation tests using different setups after veneering ZrO2 frameworks. Convincing features of Zenoflex dimension include excellent handling properties, very good firing shrinkage, variable layering options, variable shade guide and outstanding aesthetics. Its integration in the Zenotec CAD/CAM concept of Wieland Dental + Technik confirms that, overall, Zenoflex dimension impressively fulfils the formulated property profile of "resistant to chipping - aesthetic - digitally compatible". Restoring the entire mouth of a patient with dental implants and residual dentition is a challenge if there is a strong vertical and horizontal bone resorption, since this includes the 'pink aesthetics' and restricts the position of the implants. This report describes the case for a complete restoration using a fixed detachable upper and lower prosthesis. Both upper and lower fixed detachable restorations include the entire occlusal surface, and the incisal edges are made of 100% zirconia (Prettau zirconia, Zirkonzahn) to prevent breakage, as with conventional ceramic, which is then coloured with Colour Liquid (Zirkonzahn) to achieve the desired "pink and white aesthetics". When patients present with requirements for single dental implants the author thinks the use of a CT Scan for the clinician to use as a guide is suitable. When a patient presents requiring three or more dental implants that will rely on each other the author feels that the Schütz Dental IMPLA 3D Software will definitely enhance the placing of the dental implants from both the clinicians view and the patients. In direct restorative dentistry, there is a strong trend towards faster, more efficient placement techniques for resin composite restorations. Additionally, dentists are demanding composite materials that allow a simple, yet predictable application in the daily practice. With Tetric N-Ceram Bulk Fill it is now possible for the clinician to restore posterior teeth in a much more efficient, yet esthetically pleasing way. Due to the 4-mm bulk application and the 10-s light polymerization the total treatment time can be significantly reduced without compromising the overall quality of the final restoration. In his office for laser-assisted dentistry the author has the privilege to use lasers as an assistive, or completely independent, evidence-based tool in almost every field of dentistry. 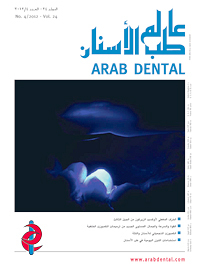 The aim of his case study is to offer some inspirations for the daily office using laser-assisted dentistry. The parameters and settings, scientifically verified, are first preset to ensure safe use of the laser. The essential requirements are: basic knowledge about physics, physiology, wavelengths, their tissue interactions and their applications, continuous education, a knowledge of the evidence-based background, and a healthy self confidence. In many routine dentistry cases, the mental state of the patient plays an important role. In the following clinical case a girl of only 12 years of age no longer wanted to go to school because she was ashamed of her smile. This girl, whose teeth 11 and 21 had become intruded through a fall and who was thus undergoing orthodontic treatment to adjust her middle incisors, attended our clinic as a patient. Our task was to develop a strategy for reconstruction of her teeth that would restore to the patient, at least temporarily, a feeling of self-esteem without having any adverse effect on her ongoing orthodontic treatment. Oral health is not only important to appearance and sense of well-being, but also to the overall health. Oral infection can have an adverse effect on other organs. Dental caries and Periodontal diseases may contribute to many serious conditions if are not treated, such as diabetes, heart disease, respiratory diseases, women delivering pre-term and low birth rate babies. Also, the associations between nutritional and medical status, and oral health have highlighted an important connection between oral and systemic health. Arrhythmia, left heart failure, angina pectoris, arterial hypertension and acute myocardial infarction are symptoms under the collective term coronary heart disease (CHD), which makes people with cardiovascular problems risk patients during dental treatment. A basic requirement is an anamnesis with which this type of patient can be identified. Prophylactic measures should be discussed with the family doctor and the specialist (cardiologist). The practice team should be prepared for any emergency situation that occurs during treatment in order to be able to react immediately. Intraoperative monitoring would be helpful. Using a case that seemed unproblematic initially but had failed several times beforehand, the author describes how planning, involving the patient in the aesthetic analysis and good communication can achieve a good predictable outcome.